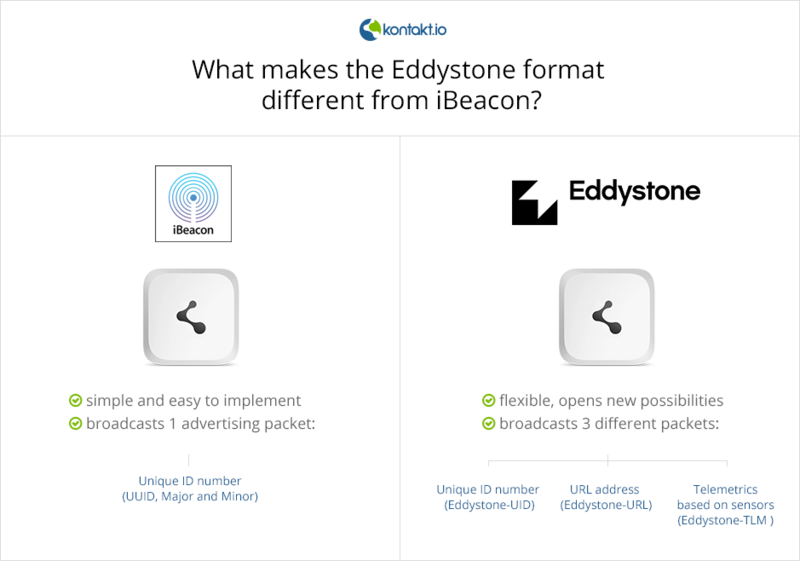 Click here and find out what makes the Eddystone format different from iBeacon. Starting from right now, we’re selling Bluetooth beacons with support for Eddystone, a new beacon format from Google! We’ve been working with Google on this project, and we’re one of the very few companies that have been involved with the process for long enough to have native support ready for the new format at the day of launch. So what is the new Eddystone? Eddystone-UID—a beacon’s unique ID number. This frame type triggers push notifications or app actions, just like Proximity UUID that you know from iBeacon. Eddystone-URL (UriBeacon’s successor)—a URL that can be broadcasted by a beacon or other object. Once a user’s device receives such signals, it displays URLs broadcasted by nearby emitters, ranked by proximity. We’ll get back to this packet in a moment. Eddystone-TLM (Telemetry)—data obtained by sensors. This frame type enables you to trigger different actions, depending on different conditions, such as temperature, air pollution, loudness, or humidity. Eddystone’s specification is published openly on the web and driven by the community, so anyone can access it and contribute to it. Have a brilliant idea on how to improve the Eddystone experience? Go on and submit it! Eddystone is meant to be the most robust and comprehensive beacon format, so it supports both Android and iOS. Finally, your proximity-enabled apps can perform as designed on both systems. Since common push notification issues on Android devices have been solved, you don’t have to worry about that anymore. That’s not all, though! You can also use the Nearby API to develop solutions based on other formats, such as iBeacon! It’s one easy proximity service for any device and for iBeacon profile and Eddystone format. As you already know, you can use Eddystone-UID to deploy real-world context to your native apps. But if some of your customers don’t use your app, or you don’t have one, you can use another frame type: the Eddystone-URL. URLs, emitted by objects and devices are the backbone of the Physical Web, another project from Google. Instead of broadcasting unique strings of numbers and letters that are only recognised by certain apps, the Eddystone-URL frame type broadcasts information that can be natively used by a phone even if it doesn’t have your app installed. That’s a game changer, giving businesses a reason to switch to Eddystone profile all by itself even if there weren’t any other advantages. Questions? Comments? Concerns? Feel free to leave them below or reach out to us. this Monday was too optimistic–sorry about that. The day of the new release isn’t fixed yet but I can promise we’re working really hard to deliver this new feature to your current beacons as soon as possible. Please stay tuned. What about existing kontakt.io beacons and cloud beacon? Is their firmware upgradeable to support Eddystone and retain existing functionality? Maybe someone can help me. URL’s broadcast by the Uribeacon can only be translated by a browser that supports Physical Web URLs. Is this the same with Eddystone URLs? Or, can Eddystone URLs be translated by any browser? (i.e Safari). Eddystone-URL is almost fully compatible with Physical Web and therefore can be translated by browsers that support Eddystone-URL right now. Thanks for the info. What about browsers like Safari and Firefox? Can Eddystone URLs be translated by these browsers? You know, Google can adjust its browser, but has no impact on other providers’ apps. So as long as Mozilla and Apple don’t implement support for Eddystone/Physical Web to their browsers, I wouldn’t count on it. That’s exactly what I anticipated. On one hand, I can picture other companies implementing Eddystone support into their browsers and apps. Then again, why would Apple incorporate this when they have a different beacon standard all their own? Thanks for the insight, Agnieszka. For now, it seems as if a solution that is completely independent of requiring users to download a necessary app for every OS platform is still unavailable. Arvil, there’s another scenario I can see–since Google decided to conquere Apple on the beacon playground not only by rolling out their own beacon format, but also by addressing some issues Apple didn’t solve, Apple has no choice. They have to follow the new trend. I think the open and URL-enabled iBeacon is just a matter of time. I think this is realistic because Apple is missing opportunities to expand their iBeacon format and they have to recognize that. If and when Eddystone URLs can be translated by other browsers (excluding Safari of course) I think Apple has no choice. Sounds like a bright future! 1) Eddystone URLs are supported by every smartphone browser? 2) URLs will be pushed to users phone or its more user driven? Like user need to scan for nearby urls? 3) Which all major beacon providers supporting Eddystone and does their old beacons support this with firmware upgrade? Excited to see new opportunities this can bring to the table. Ad. 1) No, not right now. But we belive it’s a matter of time only. Is their an Android based app that allows me to configure and manage my Eddystone beacons or am I still going to need an iPhone for that? We’re rolling out an Admin App for Android by the end of this month. You can also manage your beacons in your Web Panel. is there any new about how this Eddystone Format will behave on IOS Background??? it’s on the Apple’s side–they give applications permission to run in the background (energy consumption issues). Sorry i didn’t understand that: the eddystone beacon will be recognized by iOS CoreLocation API (maybe just for the basic uuid kind of message) or not? Nope, Google has no access to iOS’ CoreLocation. Therefore, beacons with support for Eddystone will be recognized by CoreBluetooth. So at the moment there isn’t background recognition for beacons in area, right? Well, we can’t say that background scanning doesn’t work at all, since CoreBluetooth enables it to some degree. technically, it is true. BluetoothCore enables a certain degree of background scanning but, sadly, it isn’t the kind of performance we would expect from background scanning. It works slower so isn’t capable of triggering every data packet broadcased by every single beacons. Unless you wait for it long enough. technically, it is true. BluetoothCore enables a certain degree of background scanning but, sadly, it isn’t the kind of performance we would expect from background scanning. It works slower so isn’t capable of triggering every data packet broadcased by every single beacon. Unless you wait for it long enough. Just want some clarifications. I know the beacons push information to the user phone, how does one put the information in the device that is to be displayed. Also i would like to know that can the owner of the eddystone device get information on the location of the users near its location and their information? Are you asking about Eddystone-UID or Eddystone-URL? Eddystone-UID works the same as Proximity-UUID–it contains data that can be recognized and read by a dedicated app that performs any action you design. When it comes to user tracking, beacons aren’t meant to provide exact location, but proximity. If you want to know user’s position, you need to perform trilateration, using at least three beacons. In terms of information, I understand you mean demographics or some personal data. In this case, it’s on your app’s side (beacons can’t collect any data). Standard analytics or a possibility to login using social media accounts would work here. Eddystone has opened the floodgates for brands, marketers, developers and agencies alike to push anything they want via chrome browser. And while, admittedly this sounds good for the brand-side, the consumer is in for quite an overwhelming experience when it comes to the ads, URL’s etc. it’s quite possible that the users personal phone will turn into a giant spam pit, full of all kinds of ads. Like when you open your mailbox and throw 20 advertisements in the trash. It’s a dismal experience. Apple understands customer experience, the reason for the app, is quite intentional. It’s a limitation, and for good reason. I understand your concerns but, in fact, there’s nothing to worry about. URLs won’t spam users, because Eddystone-URL isn’t about bombarding them with push notifications everywhere they go. It’s rather about enabling them to access an on-demand list of links emitted by nearby objects. Imagine you’re visiting Krakow, Poland (because why not? :)) for the first time. You’re at the Main Square, wondering what to do and where to go. Your tour guide suggests many interesting places but you’d rather go shopping or clubbing, or join an ongoing event (there are lots of them here). You grab your smartphone and open the notification center. After a few seconds, some links appear and it turns out there’s a photography exhibition near you. You go there and enjoy the photos. Your smartphone won’t bother you–you’ll see Eddystone-triggered links only if you want to. I get that, but any modern OS with an Internet connection and GPS can show you what to do in a given location. To me, if ES doesn’t support push notifications it is still ultimately undermining the value of proximity, because it’s adding in extra steps. I also find it a little backwards to send the user through the Internet connection first and then to the message. Secondly, and more importantly how does a user decipher what is worth looking at and what is not, especially when a crowded retail space has many different links. First the user has to go out of their way during their shopping to open the browser notifications and then has to wade through a list of urls in order to see if something could be of potential use, something that would say save them some time, perhaps make their trip a little easier. But in doing so it’s just become more complicated. To me it seems like you’re either going to get blasted with messaging or your going to have to scroll through a list of URLs which will only work with an Internet connection. On a fundamental level, it would seem that forcing developers to push both messaging and utility through the app rather than the web, it is immediately making it relevant to the user because THEY downloaded the app because they find utility in it and the beacon ends up as an extension of that experience just in a more relevant meaningful way. Something about hyperlinks feels very spammy and arbitrary, it’s expecting the user to take extra steps or risk being berated with various links that may or may not pose any value to them and fundamentally allowing everything to come through a single floodgate is bound to produce a less measured approach. With I beacon, If I get a Walmart message about XYZ in a WM because I have the app and I share all my purchase history with them, then strategically placed beacons can relay highly specific value messages and time saving features, etc. it’s the specificity that will drive bluetooths success. It may at first seem more daunting to developers and require more creativity and user trust, but in the end I think it would pay off on spades, because it’s adding specific ‘value’ in a specific space under very specific circumstances. When something highly relevant and invited pops up, a message that saves you time money and/or adds experiential value to your trip then you will have experienced something quite ‘magical’. The ability to push a message based on proximity is not revolutionary. The specificity and relevancy is what will be a game changer. With I beacon there will be winners and losers, but the winners will have exceptional results. I just feel like based on the eddy stone system, it will be an inherently ‘messier’ process, and thus will turn more people off to it before they realize it can add value to their existing physical experiences, whether that be shopping, bar hopping, or going to the museum. At the end of the day, I think ibeacon is built for the crowded market space, where many signals are flying, but they all have specific flight paths to individual users, attached to their trusted and personal apps, not a widely popular, but arbitrary web browser. Thoughts? I agree 100% with you. Beacons and proximity are all about relevancy and delivering added value to users, not about spamming them. That’s why Google decided that Eddystone-URLs shouldn’t be delivered as push messages, but an on-demand list. Sure, it requires more “steps” from a user, but it doesn’t spam him or her. It’s worth mentioning that the list doesn’t contain plain links so you have to guess which one might be relevant to you. Links go with meta titles attached to them. What you see, then, is e.g. “Shoes 20% off” + link (not just the mysterious link itself)–that helps you pick best links. Also, links are ranked based on their proximity. The system isn’t perfect, but Eddystone is just at its beginnings. Here, at Kontakt.io, we believe it’ll grow and bring more opportunities. Also, please remember that Eddystone isn’t equal to Eddystone-URL. Eddystone-URL is just one frame (part) of the format. Apart from delivering links, it works with apps in the Eddystone-UID frame and offers standard features that iBeacon does (the ones you like more), dedicated to Android. 1) With ibeacon in iOS, I indicate that I am monitoring for specific ‘regions’ which determine what beacon broadcasts to receive notifications for, and what not to. Is it possible to have something similar based on Eddystone URL, where there is ‘some’ form of filtering of the URLS, or are nearby URLs picked up and displayed to me? 2) Do URL broadcasts come with some form of metadata, so that I can identify what the URL is about, or am I simply literally presented with a large list of links? 3) What actions is my phone able to do once it picks up a URL broadcast? Can it automatically make an API call? Can it trigger a notification? 4) On the phone end, can my phone scan for ‘both’ eddystone ‘and’ ibeacon, at the same time? 1) That’s what Eddystone-UID does. Or rather: that’s what you can do with your app based on Eddystone-UID. You can’t design your beacon to broadcast different content depending on a user’s location–it’ll always broadcast the same signal. You can design your app to do so. So here’s the thing: in order to do make Eddystone (or any beacon) to do anything you want, you need an app. Since Eddystone support is native on Android devices and built into the Chrome browser on iOS, you can’t impact how the content is displayed, or trigger other actions. Theoretically, you could develop your dedicated app that would filter URLs, but I don’t think that makes any sense. Please let me know if that’s what you’ve asked about and whether I managed to explain it. 2) & 3) Eddystone-URL broadcasts some metadata. If a user taps on a link, a browser opens, displaying a website you linked to. I explained the Eddystone-URL mechanics here: http://kontakt.io/blog/eddystone-faq/#section3 I think you’ll find other answers to your questions there, too. 4) A smartphone doesn’t scan for Eddystones or iBeacons. It scans for Bluetooth devices. So yes, it can receive signals from different beacon profiles/formats. I hope I’ve helped you a bit 🙂 If you have more questions, just ask! A) There is no such thing as ‘monitoring’ for a ‘URL’ in the same way that in iOS I can have my app monitor for a specific region. I can’t give my app a URL, and have it send me a notification when the app is in the background, and I pass an eddystone beacon that sends that URL. A) Currently in iOS monitoring for such UUIDs is much more energy inefficient, than if I was monitoring for an iBeacon broadcast. B) It is theoretically possible to have a beacon that broadcasts both an iBeacon and eddystone transmission at the same time, but this would create issues with the battery power life expectancy of the beacon. C) In your other article you mention that because iOS monitoring is performed via CoreBluetooth, it has fewer features? Namely, what are the fewer features? What can my app tell the phone to do if an eddystone broadcast is identified in monitoring? D) As per your other article, monitoring for an Eddystone UUID can trigger a home screen notification, BUT that can’t be used to turn on an application that is not currently running on the device. Again, if these seem like too many questions, I’d be happy to discuss via email. No worries, I’m happy to help you (as long as I can). 1A: Yes and no. Eddystone-URL is built to be received natively on Android and by the Chrome browser on iOS. It isn’t meant to operate within an app. You could, however, build your own support for that, but you’d have to build it from scratch. 1B: You’re correct and it’s actually good news: if everyone could send URLs to everyone without any app needed, users would get spammed really quickly and consequently, turned Bluetooth off. We wouldn’t like that, would we? 1D: That’s right. That’s why we recommend developing a dedicated (and responsive) landing page for Eddystone-URLs, that contains dedicated meta title. is Eddystone publicly traded or is it owned by Google? The trademark is owned by Google, but the project is open and driven by the community. Is that true that Eddystone could broadcast URL and smartphone could display (as push notification) this data without any third party apps? 1.Is it the Chrome browser on iOS which can scan Eddystone URLs or Chrome on any other OS (like Android) can also scan Eddystone URLs. 2. It is said Android support Eddystone natively. What it means ? Whether Google provide an app like GMail, Map to scan these URLs or Android generate any notification whenever it receive any URL from a beacon ? 3. How can we request the nearby beacon URLs. Is there will any place in Setting in Android ? We answered most of your questions (and more!) in our Eddystone FAQ. Please check out section 2: Eddystone-URL. Just to clarify the Android issue: Eddystone isn’t natively supported by Android yet, so it’s hard to say how it’s gonna work. We assume the philosophy will be similar to iOS support, so there will be an on-demand list of links being broadcast by nearby objects. But to see that in action, we need to wait for the official launch (which is about to happen soon). Please take a look at the FAQ and let me know if you have any questions that we haven’t covered there. We answered most of your questions (and more!) 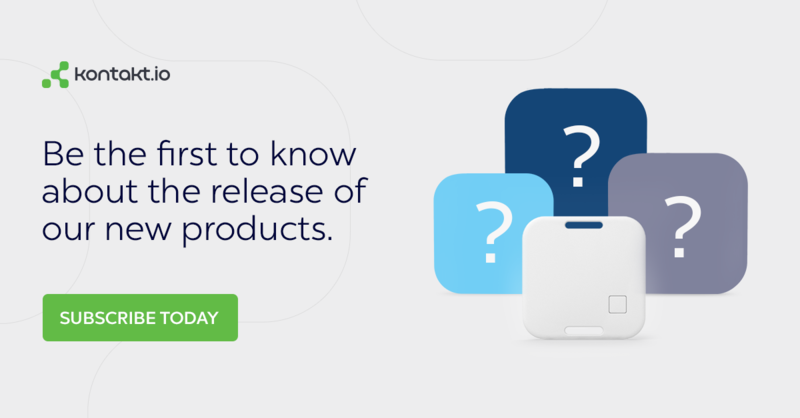 in our Eddystone FAQ: http://kontakt.io/blog/eddystone-faq Please check out section 2: Eddystone-URL. hi Christophe, no Eddytone beacon can wake up an application on iOS. This iOS feature is only available with iBeacons. But couldn’t use use a “deep link” via Eddystone to launch the app on Andoid? Christophe raises a very important issue that all the Eddystone marketing websites are deliberately ignoring! The iBeacon format can wake up apps on iOS via the iBeacon Monitoring api, even if the user killed the app from the app-switcher (and iPhone users do that a lot). From what I know, no other Bluetooth-Low-Energy format can wake up apps on iOS. With all respect to Eddystone’s smart new features, I don’t see developers accepting the idea that their app won’t wake up automatically on iPhones. Are there any beacons on the market that advertise both in iBeacon format and Eddystone format? Eddystone simply has a different purpose. If your audience is more Android-oriented, you go for Eddystone. If they use iPhones, choose iBeacon. 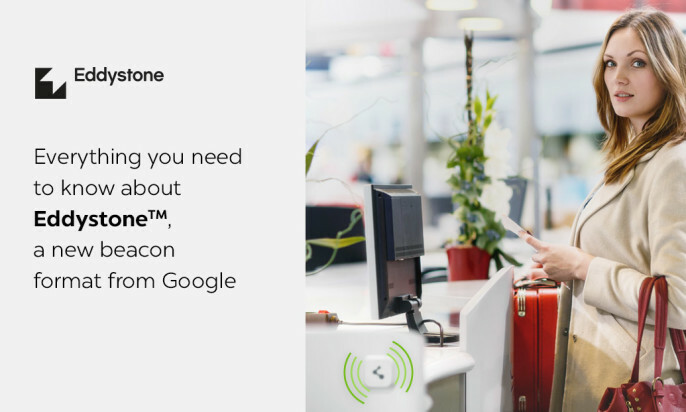 We don’t ingore the fact that Eddystone can’t wake up apps on iOS–we talked about it in this blog post: http://kontakt.io/blog/eddystone-faq , where you’ll also find out what’s holding us back from enabling our beacons to broadcast iBeacon and Eddystone at the same time. I can’t speak on behalf of other vendors but if you really need hybrid beacons and you’ll find someone who provides them, go for it. Keep in mind, though, that broadcasting two protocols will significantly affect the battery life. Agnieszka, “If your audience is more Android-oriented, you go for Eddystone. If they use iPhones, choose iBeacon.”–does this imply it might not be a bad idea to use both an iBeacon and an Eddystone beacon in the same location? Can you tell me when you expect the release for Google Chrome for Android? It’s a question to Google, I’m afraid. We’re also looking forward to Eddystone support on Android, but we don’t know when Google is going to roll it out. Stay tuned–hopefully, it’s really soon. I wonder if EddyStone beacon are able to wake up an Android application (even if the app is killed of course) thank you! Am I missing something, or is there no way to tell which Eddystone beacon is sending a particular TLM frame? I.E., if you’re standing in a room full of beacons all sending TLM frames about battery voltage, how do you know which is coming from which? Remember that Eddystone frames are only one part of the whole data packet that beacons broadcast. Each beacon has a unique MAC address that is “attached” to each frame, so you’ll always know which TLM data belongs to which beacon. Then, based on a MAC address, our SDKs look for other values that are assigned to a given beacon, and return the beacon’s identifiers. It does — I knew I was overlooking something simple. Thank you very much for the explanation!!! This is a default URL we assign to all Eddystones we sell, to show how it works and provide more information about Eddystone to those who might not be familiar with this format. You can easily change this URL in your Kontakt.io Admin App or in our Web Panel and get it to redirect to any page you’d like. How do i turn it off? Don’t like to spam people. I have 200 of these at a customer site. 3) If you set your beacons to broadcast a non-existent URL, smartphones will not display Eddystone-triggered URLs.